Mysplash-photography&wallpaper, what a mouthful, is a well designed and lightweight Android client for Unsplash.com, a "do whatever you want" photography site. All photos that are published on Unsplash are licensed under Creative Commons Zero which means that anyone can do anything with these photos. This includes copying, modifying and distributing them, using them for free, and even using them commercially. All of this without asking for permission to use the photos or attributing them. The community website works well if you connect to it using a mobile web browser. While that is the case, you may prefer to use a dedicated application as it may provide you with additional features or options. This is the case for Mysplash-photography&wallpaper, a highly rated client for the photography site. The application is free, without advertisement, and requires only one extra permission that makes sense (media). One of the benefits of the app in comparison to the website is that it displays photo after photo without any extra weight on the screen. This makes it easier to browse photos on the mobile device. You can browse new and features photos directly on the homescreen, or browse the long list of collections. If you are particularly interested in night sky, triangle or travel photography, this is the place to look for that. But that is just one option that you have. You can run searches, tap on the main menu icon to display several popular categories, e.g. people or nature, or use the second menu button (next to search), to filter photos by even more parameters. Browsing is obviously not the only thing that you can do when you use the application. You can take a closer look at any of the photos posted on the site, and either download them to your device, or set them as the lockscreen or homescreen wallpaper. The latter option did not work correctly on my Android device. The only two options presented to me when I selected the "set as wallpaper" option was to modify a contact profile photo, or the WhatsApp profile photo. I had to download the photos separately and use other means of setting them was the wallpaper image on the device. I'm not sure if this comes down to the configuration of the phone that I'm using, or if this is a wide ranging problem. It is probably the former as I could not find any complaints in the user reviews. Some users did report however that the app is crashing on them. Can only say that it did not crash once on my device, so all is good in this regard. 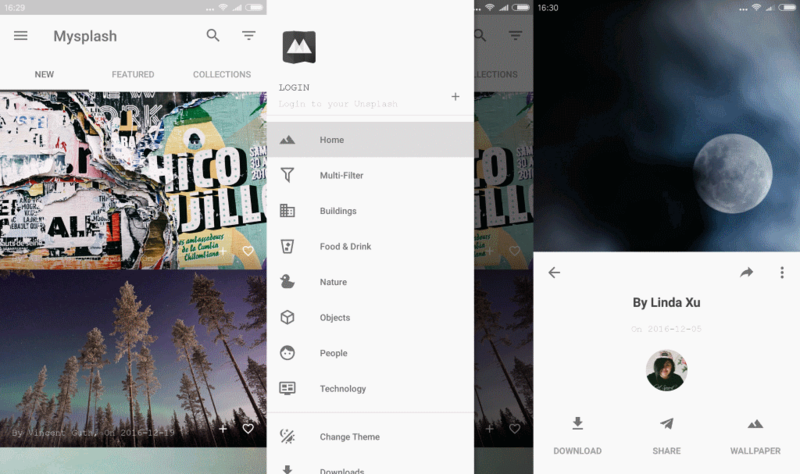 Mysplash is a slick wallpaper and photo downloading application for Android. Unsplash is home to more than 100.000 high resolution photos which means you are covered in this regard as well. Now You: What's your primary wallpaper source?